If you’re trying to save money, it’s likely you’ll be planning a lot more night’s in than night’s out. However, this doesn’t have to be a bad thing. There’s a lot of ways you can ensure your night in is enjoyable. In fact, you may even find, with the right planning, a night in can be even better than a wild night out! Not convinced? Here, you’ll discover how to ensure your night in doesn’t become a depressing affair. 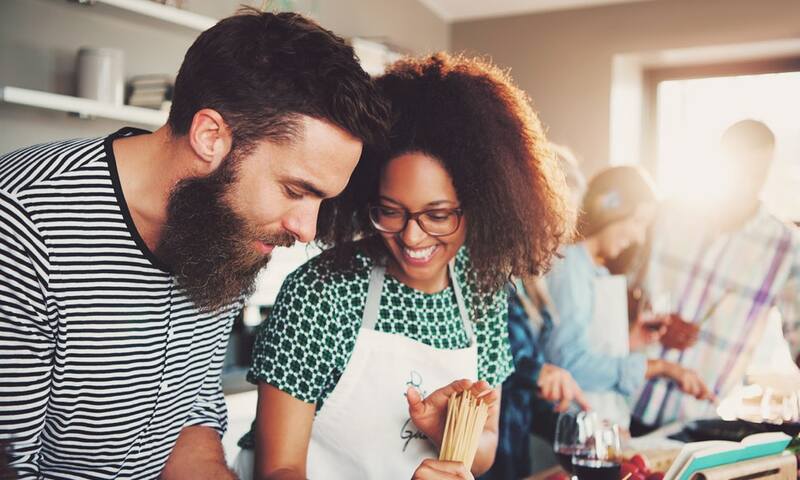 If you’re trying to organise a date night without leaving the house, a fun idea is to cook together. Takeaways may be nice, but they’re a lot more expensive than cooking something yourself. When you cook together, it’s also a great bonding experience. You’ll have fun, you can get to know each other more and you get to enjoy a nice, healthier meal without breaking the bank. Light some candles, throw on a movie and enjoy your home cooked dinner. Staying in and watching TV doesn’t have to be boring. You can avoid a depressing night in by indulging in a great film or boxset. If you haven’t seen it yet, Game of Thrones is a great series to consider – working through a great boxset can be a great way to make nights in a regular thing. Don’t just throw on the film or boxset however. Get some popcorn in, dull the lights and make a proper evening of it. When you’re trying to make your night in more enjoyable, it’s all about the ambience. You will have a depressing time if you haven’t planned ahead! Think about what you’re planning to do and then decide which type of ambience would suit the occasion. If it’s a date night, you’ll want to focus on candlelight, soft music and a nice, sensual aroma filling the room. If it’s a movie night, dim the lights, put posters up and switch on the surround sound if you have it. If not and you can afford it, it’s definitely worth investing in at least a soundbar. Setting the right ambience will help to make the evening much more enjoyable. Another way to ensure you have a great night in is to take up a new hobby. There’s a lot of indoor at-home hobbies you can try out which won’t break the bank. If you’re a creative type for example, you could try your hand at scrapbooking, journaling or painting. If you’re more of a secret geek, why not take up coding or web design? Whatever you’re into, there’s a hobby you can take up to indulge in your passion and make night’s in something to look forward to. These are just some great examples of how to avoid making your night’s in a depressing affair. These days, staying in is the new going out. You just need to know how to set the right ambience and make the most of your surroundings.